When launched in May 1962, the MGB was to become for many, the epitome of the modern British sportscar; who would have thought that this MG model with its stunning lines would prove to be the last MG to be built at the famous Abingdon factory. The MGB was in continuous production up until the closure of Abingdon in October 1980 and throughout its 18 year life span the basic body shape remained unaltered. This was apart from the post 1975 models sporting impact resistant black bumpers front and rear, primarily to meet the American safety legislation. The affordable MGB spawned many variants along the way and this was from a car that was mainly intended to be a two seater replacement for the hugely successful MGA. The GT version was announced in October 1965 and was an overnight success, again it was an affordable and very practical car that could carry two additional (although small framed) passengers in the rear compartment. The rear seat back could be folded to give a large luggage platform which was accessed from the stylish rear tailgate. The original concept of the two seater open sports MGB was considered ahead of its time in 1962 and still had not dated after production ceased in 1980 when the last MGB rolled off the Abingdon assembly line. Over half a million examples of the car in its various guises were produced, making it the best selling MG of all time. In addition to the Pininfarina styled MGB GT more powerful variants were introduced starting with the much maligned 3 litre, 6 cylinder MGC in October 1967 which also appeared in GT style. Later in August 1973 the MGB GT V8 was launched which sadly never saw the light of day in roadster form and was a low volume production of only 2591 cars. There were two limited production runs which both have their niche in MG history, commencing with the Anniversary MGB GT, a limited edition run of 750 cars to celebrate 50 years of MG production. These green with gold livery GTs were launched in May 1975 and are now very much sought after as collectors cars. To mark the end of MGB production and sadly the last MGs to be produced at the Abingdon factory, a limited run of 1000 cars were built in distinctive metallic paintwork. Known as the Limited Edition, 580 GTs in Pewter Grey and 420 Roadsters in Bronze were completed by a demoralised workforce. The GT version of the MGB was a high priority for Abingdon, in fact it is known that John Thornley and Syd Enever would dearly have liked to produce this car prior to the open topped MGB, but mindful of the public demand for the MGA replacement the roadster won the day. 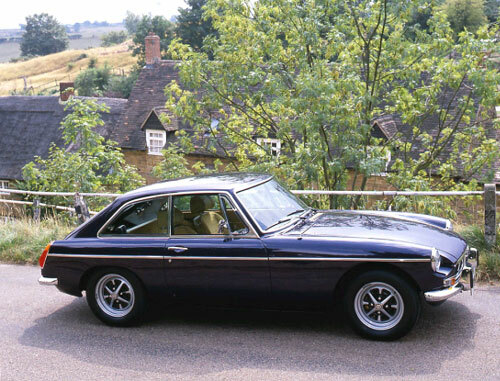 Within three years of the launch of the MGB, the GT made its debut at the 1965 Earls Court Motor Show. It was evident that the public would have liked more refinement as far back as the introduction of the MGA roadster in 1955, because there was high demand for factory hardtops for these cars. In 1956 a coupe version of the MGA was announced but this still did not afford any extra cabin space and it was to be another 9 years until the arrival of the MGB GT before proper provision was made for the comfort of the occupants and a sensible load carrying capacity. The Abingdon designers were mindful of public demand for greater refinement in their sports cars. Many potential customers were calling for a car that looked a true sports car on the one hand but carried many of the creature comforts normally only found on the more staid saloon cars. The MGA coupe fitted the bill to a degree with wind up windows, lockable doors etc but it was not until the advent of the MGB GT that the more discerning sports car owners' dreams were realised. A forerunner to the GT appeared in January 1964 albeit not a factory produced version. Jaques Coune, a Belgian coachbuilder designed and built the Berlinette MGB 1800 which many people believed was the prototype on which the factory GT was based. In fact it was produced totally independently of Abingdon although it was the Managing Director of the Nuffield Press who commissioned the first car and whilst the car received the nod of approval from some of the BMC hierarchy, the connection went no further than that. Whilst Coune had produced a vehicle that was loosely similar to the GT that was still on the drawing board in Abingdon, the Berlinette was made in such small numbers (58 in total) that it in no way detracted from the factory project. 20 months later the MGB GT was launched to a very enthusiastic motoring press and with glowing reports in every journal, the car was assured immediate success. On sale at £825 plus purchase tax of £173 8s 9d the GT was exceptional value and the total price was just under the £1000 psychological barrier. This however was the just for the basic car, many of the refinements were listed as optional extras, such as £14 6s 1d for a fresh air heater, overdrive was an option at £60 8s 4d whilst seat belts (not compulsory in 1965 were £3 5s Od each! The MGB when launched was an all-new car in many respects and was distinguished by its unitary body and chassis structure. This mono-coque construction allowed engineers more scope with design and layout of the passenger compartment particularly with the absence of intrusive cross members that were so evident on the forerunners. The GT version gave considerably more accommodation than the Roadster with the occasional rear seat and the very usable luggage platform. Weighing in at 251 lbs heavier than the Roadster, the GT was not such a good performer acceleration wise as the open top version, although due to the GTs superior aerodynamics a higher top speed of over 100 mph was achievable. The Italian design studio of Pininfarina were responsible for the GTs very pleasing lines and it was one of the first mass production cars to benefit from the relatively newly developed computer aided design techniques. Many Roadster components were common to the GT, although it carried some that were unique, such as the doors, wings and obviously the roof. Mechanically it was virtually identical to the Roadster with the exception of the fitment of a Salisbury type tube axle, different spring ratings. The new five bearing engine introduced on the Roadster in 1964 was fitted on the GT from inception. In its 15 year production span the GT was to prove a very popular and adaptable car with over 125,000 examples built. Ultimately through lack of investment, forced legislation, economic pressures and too many top Leyland management showing unjustified support for the development of Triumph, the MGB and GT together with the Midget were killed off and assigned to the history books and with them the famous Abingdon factory. Valve operation: overhead operated by tappets pushrods and rockers. Suspension: front; coil and wishbone, rear; live axle with semi elliptic leaf springs.